The Joslyns planned to create an unprecedented landmark estate on the Sutphen Farm property that they purchased on the western outskirts of Omaha in 1893. They called their home Lynhurst, but from day one, everyone else called it the Castle. A plan was developed by architect John McDonald that included the massive residence, a carriage house with servants’ quarters, a gardener’s office, and a gatehouse residence. 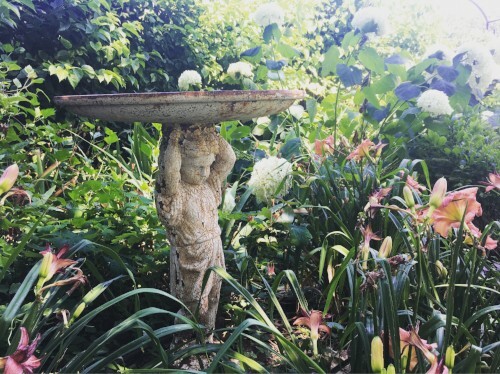 Before the mansion was built, a large greenhouse, a palm house, a lily pond for aquatic flowers, and flowerbeds and gardens were planned and built. The estate was enclosed with a limestone wall topped with an ornamental wrought iron fence well before the mansion’s construction was underway. The original Palm House, prior to being destroyed in the 1913 Easter tornado. Landscape architect Jens Jensen designed the rock work and pools for the conservatory inside the house. The estate’s landscaping was arranged in an informal, yet lavish, style. Not wanting to wait years to enjoy the grounds, the Joslyns had more than 100 mature trees planted. They built a greenhouse to provide a constantly changing display of flowers for the giant flowerbeds on the 5.57-acre estate. 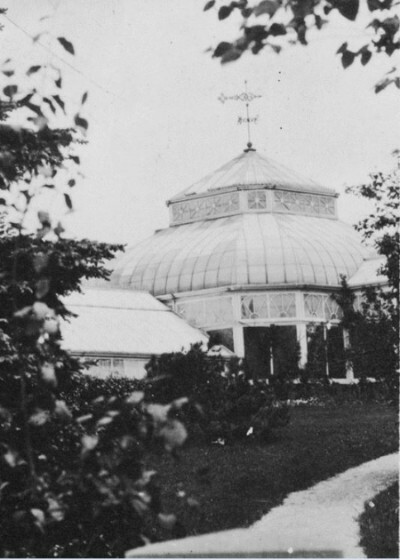 By 1899, the grounds were developed and the greenhouse completed. Sarah and George developed a nationally respected collection of orchids in the greenhouse. On Easter Sunday morning, March 23, 1913, Mrs. Joslyn took her friends to the green house to view her orchid collection. That afternoon, one of the city’s worst tornados destroyed the greenhouse, much of the Castle grounds, and a wide swath of Omaha. While the orchids survived the tornado itself, a hard freeze followed on the heels of the tornado, destroying the collection. 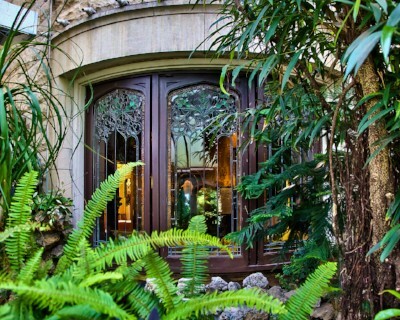 The Conservatory designed by renowned landscape architect Jens Jensen. George donated the remnants of the greenhouse to the City of Omaha and built, in its place, a small, six-sided clapboard summer house. To its east side was a grape arbor and squirrel house. Birdhouses and bird feeding stations were placed throughout the Castle grounds, thoughtfully located near plants favored by various birds for food and nesting. 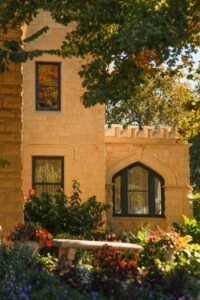 The estate grounds were the first to be designated a landmark affiliate site when the Nebraska Statewide Arboretum was established in 1996. Today, landscape restoration is underway: seasonal flower beds are tended as are perennial plants and bushes. The majestic trees are well cared for and many new trees have been planted. In time, two ponds forming a figure eight, spanned by a footbridge at the narrow point, will reappear as will the greenhouse. The Joslyn Castle and its dedicated volunteers have been working to restore every detail of the lavish estate for many years. It invites membership and support from those who want to support a piece of living history in the heart of Omaha. The Joslyn Castle gardens and grounds are a public green space located in the heart of Midtown. We invite you to enjoy the open spaces, well-lit pathways, picnic tables, and stunning variety of trees and flowers!